My family had known the owners of the original Torque Manufacturing here in Seattle during the seventies. I still have one of their carbon fiber Pro-Slalom decks that i bought for $35 back in 1976. I was such a scrawny kid that I didn't even make the board flex like it was designed, and the thing is pretty beat after much use between 1976-1981. Ed LeCoque was the man. The company was primarily a waterski maker, but the owner had the desire and technology to make some pretty nice boards. They backed Henry Hester with a fully enclosed downhill, speed record-holding setup too as I recall. 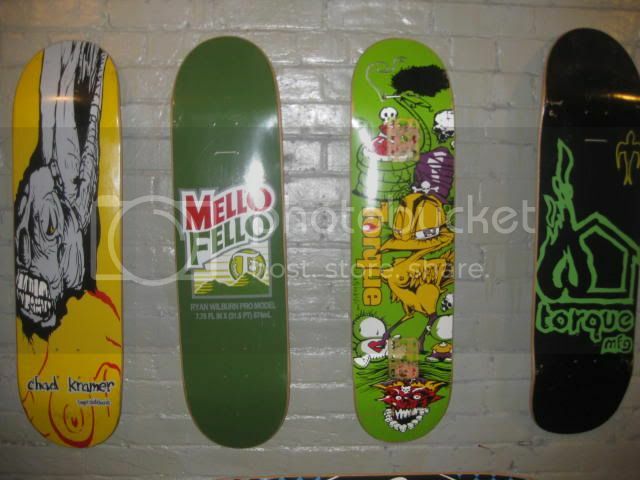 Makes me laugh when I see companies that say they pioneered CF decks in the nineties! here is my part from the last vidoe torque put out. 50-50 mania. good times. just putting it out there for you..
Thomas is also using the flaming heart and fire hose graphics on some of his new shop decks. Check out the Stratosphere website.